Quando nel 2011 fu organizzata la mostra "Salvatore Deodato - dall'ideazione alla crezione" presso il Museo "Cav. Vincenzo Andolfi" di Sant'Elpidio A Mare, si pensava che l'eccentrica serie che il designer realizzò per il calzaturificio Romea di Campagna Lucia (VE), con la collaborazione del tacchificio Vale, fosse andata irrimediabilmente perduta. Ora invece stanno emergendo esemplari da musei ogni volta diversi anche se nessuno - finora - era stato attribuito a Deodato. 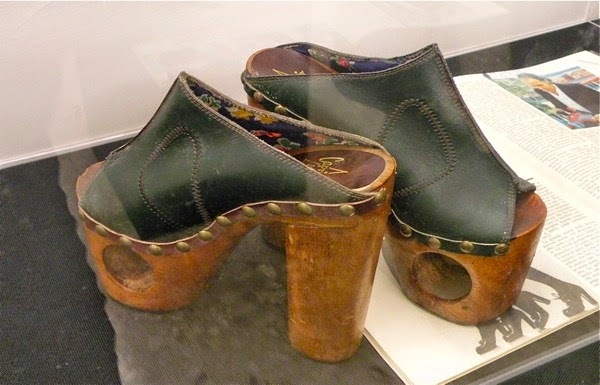 Dopo la versione conservata presso la Walker Art Gallery di Liverpool, quella esposta al LVR di Bonn e la versione conservata al Ledermuseum di Waalwijk in Olanda, ora è la volta di Belgrado, in Serbia, dove la mostra "Oh, Those Shoes!" ne presenta un paio ancora diverso. "Le scarpe presso il nostro museo sono marchiate Romea e credo furono disegnate da Salvatore Deodato. L'allora adolescente Lana Zafirović di Belgrado le acquistò a Milano, dopo averle viste sulla copertina di Vogue nel 1972." così ci ha raccontato Bojana Popović, curatrice della mostra "Oh, Those Shoes!". The exhibition "Salvatore Deodato - From concept to creation" at the Museum "Cav. Vincenzo Andolfi" in Sant 'Elpidio a Mare was organized in 2011. 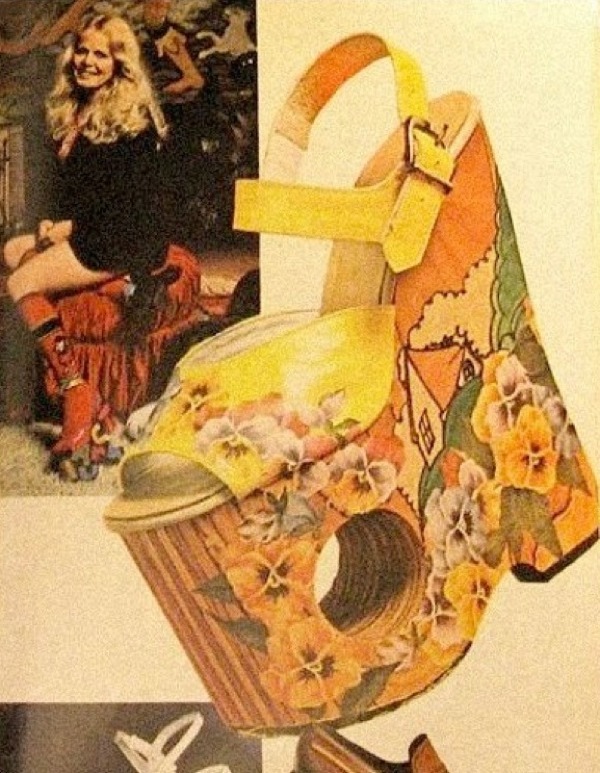 It seemed at that time that the stunning series created by the designer for the shoe factory Romea (Campagna Lucia – Venice), in collaboration with the last maker Vale, was lost forever. So it comes with great surprise that different models are popping up from museums across Europe, even though not attributed to Deodato (until now). 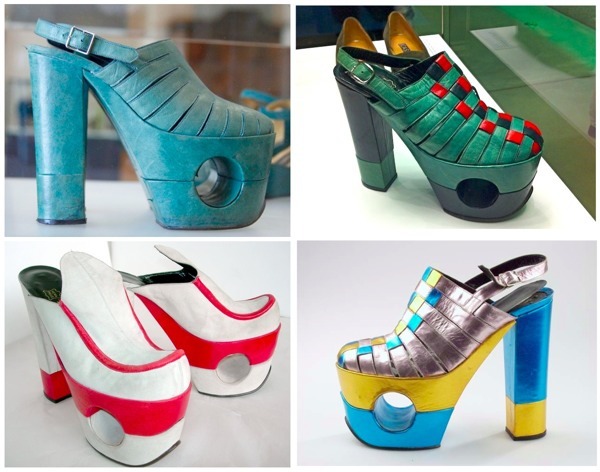 The iconic Deodato/Romea model is now showcased in Belgrade, Serbia at the exhibition "Oh, Those Shoes!”, following the one kept at the Walker Art Gallery in Liverpool, the model on display at the LVR’s Schuhtick exhibition (Bonn) and the pair stored at the Leather Museum in Waalwijk, Netherlands. 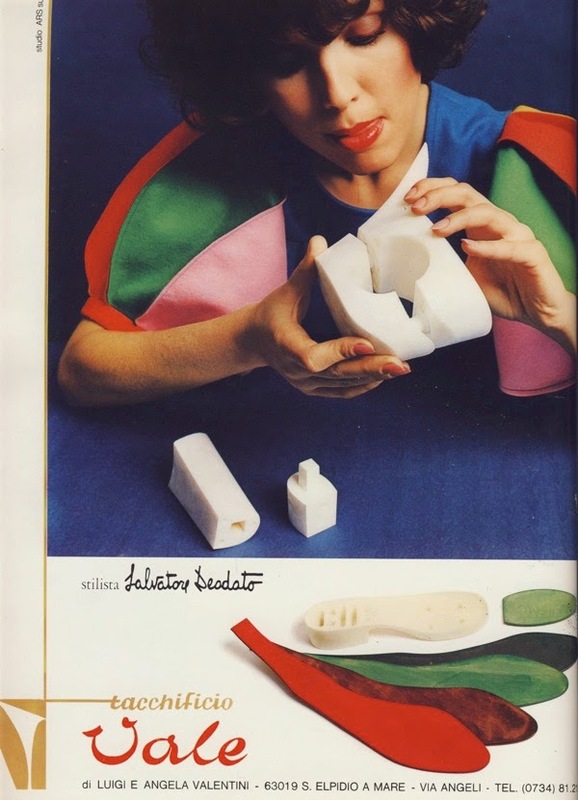 "The shoes of our Museum are branded Romea and, I believe, designed by Salvatore Deodoto. Lana Zafirović, a teenager from Belgrade, had seen those shoes on the cover of the Vogue and bought them in Milan in 1972." told us Mrs. Bojana Popović, curator of the exhibition"Oh, Those Shoes!". Slatten's hole-in-the-wall wedgie (center) is of laminated wood with decoupage sides and a $ 90 price tag. Location Unknown / Unclear - London? Girls and men walking. Reporter interviewing various people about the claims that platform shoes being health hazard. An expert talks about it but is not very good in convincing a girl not to wear them (The Deodatos). More people on the street being interviewed. Some people say they look ridiculous, shoe salesman defences them with bizarre explanations etc. 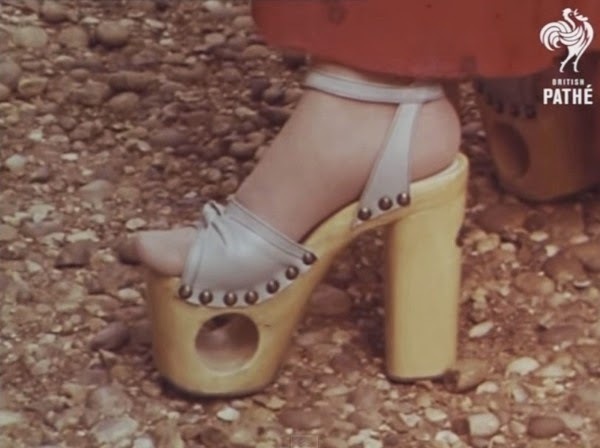 The end of an item shows the reporter wearing platform shoes and having difficulty walking. Voiceover informs that most of the injuries happen in the first few days of wearing them. Reporter walks off with difficulty. Cataloguer's note - brilliant item, very entertaining. Indeed, and the hilarious footage can be seen here. 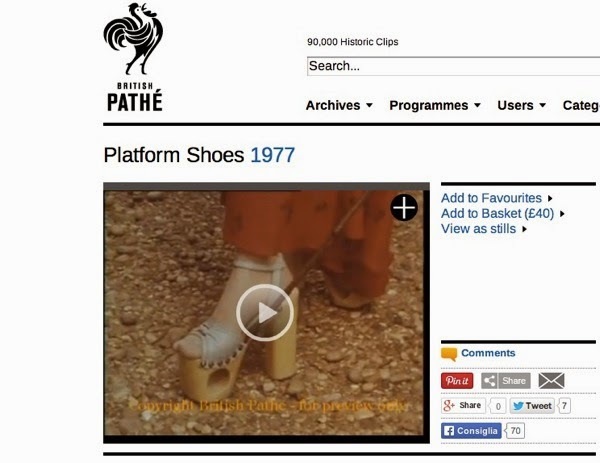 1977 | Platform Shoes | U.K.